I sat, delighted to be spending an afternoon with desserts and wines parading over my taste buds. The day’s menu involved German style cheesecakes and Riesling wines. Each culture has their staples; those dishes one reminisces about that lead to phrases like: “my mom makes the best…” or “my grandmother has a secret recipe for…” In Berlin, Käsekuchen sparks many a conversation or claim to fame. I found the choice of a Riesling pairing, unexpected but exciting. It is a very aromatic wine with notes of nectarines, apricots, apples and pears. It can be dry or sweet with an acidic flavor profile that hints at honey, citrus fruits and apricots. Most people would opt for a contrasting wine rather than pair sweet wines with sweet desserts. However if you have ever had something sweet to drink (i.e. hot chocolate, soda, a sweet cocktail) with a dessert, you would know that sweet has a tendency to cancel out other sweets. German cheesecakes are less sweet and much lighter than their American counterparts. They use a different kind of cheese called ‘quark’. Traditionally made without rennet, quark is an unsalted, unaged soft white cheese. It is creamy and has a very subtle flavor. Although compared to cottage cheese, curd cheese and farmer cheese, it is not really the same. 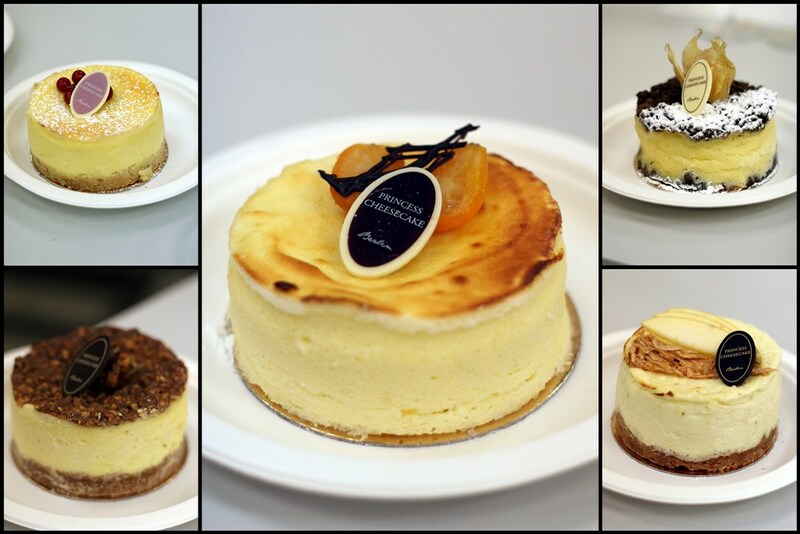 The very talented pastry chefs from Princess Cheesecake prepared 5 different cakes for us to try. I was interested in the multitude of techniques used in each cake. Though jealous with her explanations on technique and reluctant for obvious reasons to share any recipes, the panel’s pastry chef did her best to walk us through the cheesecake making process without giving us too much information. I can understand that kind of tactic when it comes to direct competition, however when you agree to host a workshop I feel you should be prepared to share your knowledge and insights. I do respect her position though. Most of my method questions went unanswered. I did learn that they key to German cheesecake is texture, which should be airy and light; an aspect heavily dependent on the chef’s choices regarding aeration techniques. Three factors were the primary focus: butter (softened vs melted), cheese fat content (low-fat vs full cream) and egg whites (liquid vs whipped). I have made a mental note to conduct my own experiments and comparisons; but it will require a certain financial investment, time allotment and a few hungry guests. Out of the artfully made pastries, my personal favorite was one that had semolina mixed into the cheesecake with whipped butter, whipped egg whites and low-fat quark. The texture was soft, light and creamy. My lips wanted nothing more than to sip the 2010 Weinheimer Holle Huxelrebe Beerenauslese, Weingut Gysler/Rheinhessen for an evening over jazz music. It had an interesting dark, dampness to its flavor and paired exceptionally well with the cheesecakes. Thank you to Naschmarkt of Markthalle Neun and Princess Cheesecake for putting the workshop together. I walked away from the class with less information that I would have liked, but a satiated hunger and peaked curiosity. I do enjoy a new challenge…perhaps some day soon. This entry was posted in continuing education, Culinary, culinary education, Culinary Travel, education, festival, food, Travel and tagged aeration, Berlin, blog, butter, chandler tomayko, cheesecake, chef, class, cook, cuisine, culinary, education, egg whites, europe, festival, food, german, high fat, Italy, Käsekuchen, low fat, Naschmarkt, Naschmarkt of Markthalle Neun, pastry, Princess Cheesecake, quark, Rheinhessen, Riesling, salone del gusto, slow food, technique, thoughts, travel, trip, turin, updates, Weingut Dr. Loosen, Weingut Gysler, workshop. Bookmark the permalink.